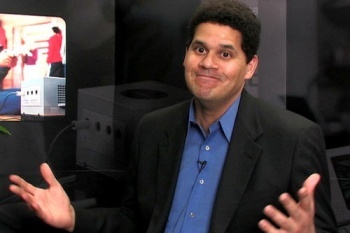 Reggie Fils-Aime says Nintendon't make mature games because it has absolutely no desire to do so. The Nintendo Wii has plenty of kid-friendly titles available that the entire family can enjoy for hours upon hours of arm-waggling fun, but why hasn't Nintendo embraced any segment of a more mature audience? Nintendo bigwig Reggie Fils-Aime told MTV that, despite wanting to appeal to as many consumers as possible, Nintendo simply doesn't do mature. every consumer has content that they're going to enjoy." There is a snag when it comes to Nintendo actually creating mature content like one would easily find in triple-A form on the Xbox 360 or PlayStation 3. "The challenge for us is that we ourselves, Nintendo, don't create that type of content. We're not experts at it, our developers don't particularly enjoy making that type of content. They probably could make stellar content if they chose to; we choose to do something else." It looks like the most violent game we'll ever see out of Nintendo will be Smash Bros. Still, Nintendo encourages third-parties to make a niche for themselves on the Wii, if they can. "It really is up to the third party developer to create that great content and bring it to life on our platform. There have been some tremendous successes: Resident Evil and that franchise has done exceptionally well. I'd say that while there have also maybe not been commercial successes, the products have been stellar: Grand Theft Auto on the DS is an example." To all the Wii owners out there that want more mature titles, Reggis has some advice: "What we want to do is continue to encourage that type of development, and candidly, also encourage those consumers who have been saying 'Hey, Nintendo, where is this content' to go out there and buy it and support it. I can lay out a tremendous amount of games that are of high quality that have gone largely ignored by the very consumers that are asking for them." He's right, and the question I ask is: Why? Resident Evil sells because it's Resident Evil most likely, but why has virtually every other mature title gone ignored by Wii owners? For that matter, why do most unique Wii titles that aren't developed by Nintendo have trouble selling on the Wii? Are consumers afraid due to the glut of complete garbage that has saturated the Wii market, or is it something else?